Iron Man is one of the most popular Marvel Comics characters of all time, but before he was made famous by Robert Downey Jr in the Paramount Pictures film series, Playtech got on board with a range of Iron Man pokies. Find out how and where to play the Iron Man pokies games for real money bets at the best Australian-friendly online casinos. 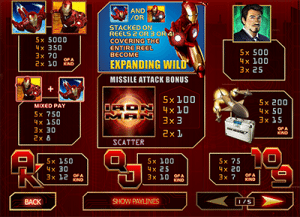 Marvel fanatics will be pleased to know there are multiple versions of the Iron Man pokies game available, but for the purpose of this article we’ll be covering the original Iron Man slot. All versions of Iron Man are available at our recommended Playtech pokies site, Casino.com. 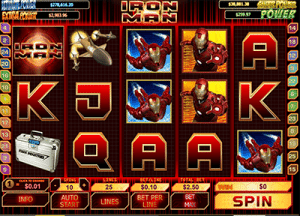 Iron Man is a five-reel, three row pokies game that comes with wild symbols, scatter symbols, a huge progressive jackpot, a bonus game and free spins. The game stays true to the original comic, with symbols set against a black grid backdrop seeped in red to maintain the feel of Stark Industries and its association with weaponry and technology. Given its progressive jackpot format, Iron Man can be played for real money bets only at Casino.com. Aussies are well catered for, with AUD deposits available using trusted payment methods like Visa, MasterCard, Neteller, Skrill or Paysafecard. Iron Man is available to play directly over your Web browser or if you’re using a PC, by downloading the exclusive Casino.com software. To play, you simply need to select the size of your wager using the buttons at the bottom of the reels. Coin values range from $0.01 to $1.00, with bets per line ranging from $0.01 to $10.00. There’s a total of 25 paylines, but these are unfixed, so you can play anywhere from one to 25 paylines per spin. Keep in mind that the higher your bet is, the higher your chances are of triggering the progressive jackpot. Minimum bets in Iron Man start at just $0.01, with maximum bets capped at $250.00. The game has a theoretical RTP (return to player) of 94.89%. Expanding Wild feature – There are two Iron Man symbols in this game, one where he’s shooting through the sky and one where he’s got his hand out in attack. While neither of these symbols work as the wild symbol per se, if either appear as stacked on reels two, three or four, they become Expanding Wilds, covering the entire reel to form some huge wins. Mixed Pay feature – Any winning combination that contains both Iron Man character symbols and begins with either of these symbols on the leftmost reel will trigger the Mixed Pay feature. Here you receive a multiplier on your line bet, with the multiplier increasing depending on how many mixed Iron Man symbols you landed. Five mixed symbols can award a whopping 750X your active bet. 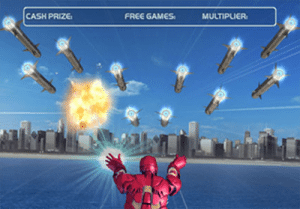 Missile Attack Bonus – An appearance of three of the Iron Man logo scatter symbols anywhere across the reels triggers the awesome Missile Attack Bonus, taking you to a new screen that sees Iron Man flying through the sky above New York City. Here you get to shoot missiles to reveal winning prizes, including free spins, bonus multipliers and cash prizes. If you get the free games bonus, you’ll receive 10 free spins during which another appearance of three or more Iron Man scatter symbols will trigger an additional 10 free spins, allowing an infinite number of free games to be won. When you’re playing Iron Man, the current value of each progressive jackpot is listed at the top of the screen, and updated in real time as you play, so you can see the prize pool growing before your eyes. The jackpot can be triggered at random anytime during the game, and will take you to a grid that looks like a scratch card. Click to uncover three matching jackpot symbols and you’ll walk away with the current amount of that corresponding jackpot. 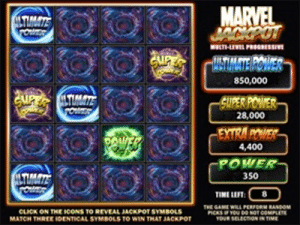 Entering this bonus round guarantees a win of one of the Marvel jackpot amounts. We’ve yet to see a Playtech game in the Marvel range that has failed to impress us. Even though Iron Man is an older title now, it still holds up against plenty of the newer games, with its bonus features making up for the slightly lacklustre graphics. Really, any game with a jackpot that large and bonus games this entertaining is a winner in our books. The original Iron Man game discussed above must have been incredibly popular, because Playtech took it upon themselves to create a whole collection of these games. If you love this Iron Man pokies, you can also enjoy such titles as Iron Man 2, Iron Man 2 50 Lines, Iron Man 3 and even the Iron Man 2 scratch card. You can play the original Iron Man pokies game and all other Iron Man slot variants at one of our top-rated casinos, Casino.com. Here new players can take advantage of an incredible 100% matched deposit welcome bonus, giving you up to $400 in free money to play with.